Check syslog, maybe it says something about the problem – referring to /var/log/messages. Syslog doesn’t support messages longer than 1K – about message format restrictions. Syslog is unreliable – referring to the UDP protocol. In this post, we’ll explain the different facets by being specific: instead of saying “syslog”, you’ll read about syslog daemons, about syslog message formats and about syslog protocols. Note the plurals: there are multiple options for each. We’ll show the important ones here to shed some light over the vague (and surprisingly rich) concept. Along the way, we’ll debunk some of the myths surrounding syslog. For example, you can choose to limit messages to 1K and you can choose to send them via UDP, but you don’t have to – it’s not even a default in modern syslog daemons. can receive local syslog messages. Traditionally /dev/log UNIX socket and kernel logs. can write them to a file. Traditionally /var/log/messages or /var/log/syslog will receive everything, while some categories of messages go to specific files, like /var/log/mail. can forward them to the network or other destinations. Traditionally, via UDP. Usually, the daemon also implements equivalent network listeners (UDP in this case). In essence, a modern syslog daemon is a log shipper that works with various syslog message formats and protocols. If you want to learn more about log shippers in general, we wrote a side-by-side comparison of Logstash and 5 other popular shippers, including rsyslog and syslog-ng. 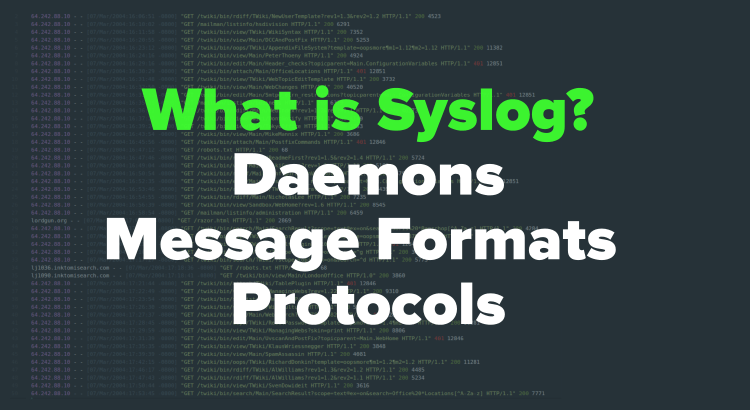 The one we come across most often is that syslog daemons are no good if you log to files or if you want to parse unstructured data. This used to be true years ago, but then so was Y2K. Things changed in the meantime. In the myth’s defense, some distributions ship with old versions of rsyslog and syslog-ng. Plus, the default configuration often only listens for /dev/log and kernel messages (it doesn’t need more), so it’s easy to generalize. <34> is a priority number. It represents the facility number multiplied by 8, to which severity is added. In this case, facility=4 (Auth) and severity=2 (Critical). mymachine is a host name where the message was written. su: is a tag. Typically this is the process name – sometimes having a PID (like su:). The tag typically ends in a colon, but it may end up just with the square brackets or with a space. the message (MSG) is everything after the tag. In this example, since we have the colon to separate the tag and the message, the message actually starts with a space. This tiny detail often gives a lot of headache when parsing. This isn’t a syslog message format, it’s just how most syslog deamons write messages to files by default. Usually, you can choose how the output data looks like, for example rsyslog has templates. Now we get an ISO-8601 timestamp, amongst other improvements. We also get more structure: the dashes you can see there are places for PID, message ID and other structured data you may have. That said, RFC5424 structured data never really took off, as people preferred to put JSON in the syslog message (whether it’s the old or the new format). Finally, the new format supports UTF8 and other encodings, not only ASCII, and it’s easier to extend because it has a version number (in this example, the 1 after the priority number). you can’t send syslog messages over 1K. It is true that RFC3164 stated that messages shouldn’t go over 1K, because it was around the maximum size of a UDP packet (now it can be higher with jumbo packets). Modern daemons don’t respect that constraint – the message limit is configurable in both rsyslog and syslog-ng. RFC5424 made this official, not only because of UDP changes but also because many other protocols are supported (see below). timestamps aren’t exact. That is true for RFC3164 timestamps, but not for the RFC5424 ones. there’s no structure beyond predefined fields. In fact, any modern syslog will happily parse a JSON from the message field. They can parse any kind of message format (structured or not). Originally, syslog messages were sent over the wire via UDP – which was also mentioned in RFC3164. It was later standardized in RFC5426, after the new message format (RFC5424) was published. Besides writing to files and communicating to each other, modern syslog daemons can also write to other destinations. For example, datastores like MySQL or Elasticsearch or queue systems such as Kafka and RabbitMQ. Each such destination often comes with its own protocol and message format. For example, Elasticsearch uses JSON over HTTP (though you can also secure it and send syslog messages over HTTPS). The ones we hear most come from the assumption that UDP is the only option, implying there’s no reliability, authorization or encryption. The other frequent one is that you can’t send multiline messages, like stack traces. This is only true for TCP syslog, if newlines are used for delimiting. Then, a stacktrace will end up as multiple messages at the destination – unless its newlines are escaped at the source and reverted at the destination. With UDP, multiline logs work out of the box, because you have one message per datagram. Other protocols (TLS, RELP and octet-delimited TCP) also handle multiline logs well, by framing messages. Hopefully this post helped clear the fog around syslog. If you’re looking for tips on how to configure your syslog daemon, you can find a lot of them on this blog. We especially love the topic of centralizing logs with Elasticsearch. That’s because we run Logsene, our logging SaaS that exposes the Elasticsearch API which supports all the syslog we discussed here in terms of message formats (including JSON over syslog) and protocols (UDP, TCP, TLS, RELP). You can sign up and get a free Logsene trial here. You’ll find configuration samples for all major log shippers (including the syslog daemons discussed in this post). If you’re looking to build a log-centralization solution for yourself, we can help: either through logging consulting or trainings on Elasticsearch and its logging ecosystem. If you’re into logging in general and want to build such solutions for others, we’re hiring worldwide. syslog-ng is also optimized for performance. It just scales slightly differently. Rsyslog scales better for UDP connections or single TCP connections. Here syslog-ng is limited to a single core for incoming messages and in these use cases rsyslog is definitely faster on a multi-core machine. On the other hand, when there are multiple TCP connections, syslog-ng scaled better in my measurements. Also, using complex configurations with many rules, filters, etc., syslog-ng did not slow down as much as rsyslog. I did not check it this year, but the above results were consistent ever since threading was introduced to syslog-ng with version 3.3. When did you do your tests? Rsyslog has had drastic performance improvements over the years and is also multi-threaded. In any case, both rsyslog and syslog-ng can be very fast. Speed is probably not the deciding factor if you are choosing between them. I’ll let Peter reply with any details he may have. The only recent back-to-back comparison I’m aware of is in Rainer’s thesis (https://www.fernuni-hagen.de/imperia/md/content/rechnerarchitektur/rainer_gerhards.pdf – see page 73), but that only compares parsing speed. Plus, as with every performance test, configuration details and test setup (e.g. one connection vs many) have a big influence on results (as we saw when comparing Elasticsearch’s performance to Solr’s here: https://sematext.com/blog/2015/05/27/side-by-side-with-elasticsearch-and-solr-performance-and-scalability/).